We provide users (“you”, “your” or “User(s)”) with services, delivered via the NewspaperLists website (currently located at http://www.NewspaperLists.com), the NewspaperLists toolbar, the NewspaperLists mobile applications and/or any other platform or media through which we make such services available from time to time, that allow you to explore the Internet, find new websites that may be of interest to you, receive recommendations of websites from NewspaperLists, and join a community of individuals with similar tastes and interests (collectively, the “Services”). A User may be a “Member” (meaning a User that has registered and created an account with NewspaperLists or through one of NewspaperLists’s connected social networking communities (“Partner Communities“) and has a “NewspaperLists Profile”) or a “Visitor” (meaning a User simply browsing the website or viewing content from or affiliated with NewspaperLists), and may also include an advertiser or a developer that has created an account with NewspaperLists. a. “Personal Information” is information about you that can be used to contact or identify you, such as your full name, address, e-mail address or phone number. b. “Non-Identifying Information” means information that does not permit the identification of an individual person, such as the other information that you provide as part of registration and personalization of your NewspaperLists Profile (for example, individual preferences). Certain Non-Identifying Information would be considered a part of your Personal Information if it were combined with other identifiers (for example, combining your zip or postal code with your street address) in a way that enables you to be identified. But the same pieces of information are considered Non-Identifying Information when they are taken alone or combined only with other Non-Identifying information (for example, your viewing preferences). c. “Log Data” is derived by our servers automatically as you interact with the Services, which record information that your browser sends whenever you visit a website. Log Data is a form of Non-Identifying Information. Our primary goals is not collect information of user data. some time, we collect information for improving our Services, features and content, to administer your use of our Services, and to deliver content that may be of interest to you. a. 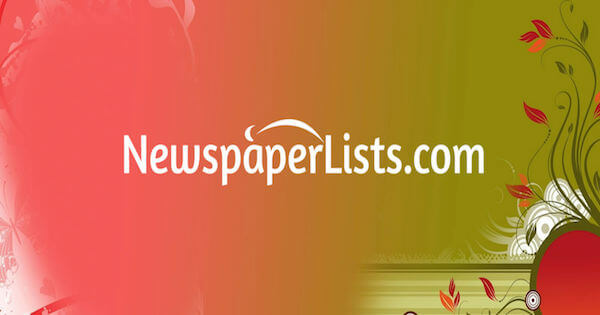 When you contact NewspaperLists or connect through our Partner Communities, we will collect your e-mail address, gender, date of birth and specific or general location. When you personalize your NewspaperLists Profile, we will also collect any information you provide, such as your full name, your photo and any optional information you decide to supply about yourself, your lifestyle and your interests. If you register for our Services via a Partner Community, we will obtain certain Personal Information you have provided to the Partner Community (such as your name, profile picture, e-mail address). The information we obtain may depend on the privacy settings you have with the Partner Community. b. We also collect from you some Non-Identifying Information about your interests as you navigate through our Services. For example, when you click on the rating buttons (thumbs up, thumbs down), or recommend a website by clicking “I like it!” in the NewspaperLists toolbar, you are explicitly sending information about your preferences for the website then displayed, which NewspaperLists will use to improve its recommendations to you and to others. We may also receive Non-Identifying Information about you and your interests from other sources like third parties that add to their websites NewspaperLists widgets or NewspaperLists badges. c. When you enter any information (including Personal Information) into any postings or comments on social site, we may collect this information, which may be available to some, a subgroup of, or even all Users of the Services, depending on how and where this information was posted by you and with whom you have elected to share the posting or comment. d. When you leave us feedback or write to us directly, we will collect any information that is contained in your feedback form, which will include your e-mail address and other information that you may submit to us for reference or reply. e. As mentioned, when you interact with the Services our servers automatically record Log Data that your browser sends whenever you visit a website. This Log Data may include information such as your computer’s IP (Internet Protocol) address, your mobile device identifier, the geographic location of the IP address you are using to access the Internet, browser type, operating system (including identifying whether you are connecting via a mobile device), the time of day of your access, your general physical location or your more specific location if you are connecting through your mobile device, and the website that you visited immediately prior to NewspaperLists. We use your Personal Information in some cases in conjunction with your Non-Identifying Information to recommend and deliver to you personalized content from across the web, including from advertisers, based on your expressed preferences and inferred interests. Log Data is used to monitor and analyze use of the Services, to determine the composition of and engage our user base, to analyze usage patterns, to optimize your access to our Services, and to control the load on our servers so that we can serve you better. We also combine your Personal Information with Non-Identifying Information and Log Data and aggregate it with information collected from other Users to attempt to provide you with better recommendations, to improve the quality and performance of our Services and to analyze and understand how our Services are used. We may use your e-mail address to inform you about changes to our Services, and, should you agree to receive such communications from us, send you newsletters or promotional e-mails about the Services. a. What are cookies? Cookies are very small text files that are stored on your computer when you visit certain websites. They are used by web developers to help users navigate their websites efficiently and perform certain functions. More information about cookies is available at: http://www.allaboutcookies.org/. b. What kinds of cookies does NewspaperLists use? We may use both session cookies (which expire once you close your browser) and persistent cookies (which remain for a certain period of time unless deleted) to provide Non-Identifying Information to us about Users. We also collect Non-Identifying Information about your immediate web history and interests through NewspaperLists badges and widgets that appear on third party websites. d. Your Options: Most browsers are initially set up to accept cookies. You can reset your browser to refuse all cookies or to indicate when a cookie is being set. You may also choose to opt out of tracking so that websites like NewspaperLists cannot learn from your interactions and viewing history. Instructions to remove persistent cookies and to engage “Do Not Track” can be found through your Internet browser. Mobile devices may contain settings that allow you to disable tracking and/or analytics. Be aware that if you choose to disable cookies or opt out of tracking or disengage similar features on your mobile device, some areas of the Services may not be optimized for your use, you may not be able to access any or all of the functionality of the Services and your experience using the Services will not be personalized to your interests. a. Aggregate Information and Non-Identifying Information. We may share aggregated information that does not include Personal Information and we may otherwise disclose Non-Identifying Information and Log Data with third parties for industry analysis, demographic profiling, marketing, and other purposes relating to our Services. Any aggregated information shared in these contexts will not contain your Personal Information. We do not share Personal Information with advertisers. b. Service Providers. We may employ third party companies and individuals to facilitate our Services, to provide the Services on our behalf, to perform site-related services (e.g., without limitation, maintenance services, database management, web analytics and improvement of the Services’ features) or to assist us in analyzing how our Services are used. These third parties have access to your Personal Information only to perform these tasks on our behalf and are obligated not to disclose or use it for any other purpose. d. Compliance with Laws and Law Enforcement. We will access and disclose your Personal Information to government or law enforcement officials or private parties if we believe in good faith that such disclosure is necessary to comply with relevant laws, to respond to valid legal process such as a search warrant, subpoena, statute, or court order, to protect the property and rights of NewspaperLists or a third party, to protect the safety of the public or any person, or to prevent or stop activity we may consider to be, or to pose a risk of being, illegal, unethical or legally actionable.